Shyloh Belnap: These are so cute, I had to share! These are so cute, I had to share! I just finished making some "mini' witch boot kits. They come with everything you need except the black paint to complete. The cost is $5.49. 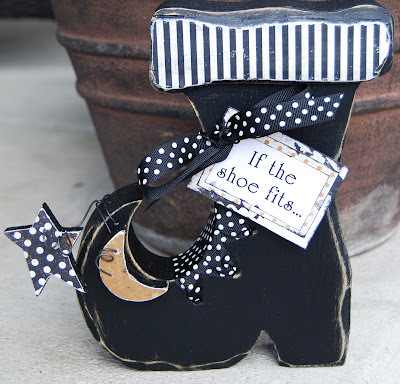 The "If the shoe fits" boot comes with EVERYTHING you will need including paint, sandpaper, brush. The kit is only $15.00 and I think it is the CUTEST Halloween decoration ever! Quantities are limited!